Nestled in the lush rainforest, this is the ideal hideaway for nature lovers and the perfect place to discover the wonders of the Tortuguero National Park. 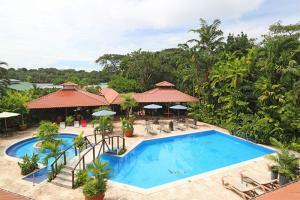 The Lodge is set on fifteen beachfront acres, offering spectacular views of the Tortuguero Lagoon and the canals. All the spacious and comfortable rooms are built in fine woods and are equipped with either one double and one single bed or three single beds. Mawamba Lodge is situated on the Northeast area of Costa Rica's Caribbean Coast on a sand bar between the Tortuguero Canals and the Caribbean Sea.